Goshen and Monroe drivers love the 2017 Honda Accord powertrains and mpg ratings. Whether you’re interested in flat-out V6 power, fuel economy ratings reaching up to 36 mpg,* or something in-between, you’ll be able to find what you’re looking for when you opt for the 2017 Accord. 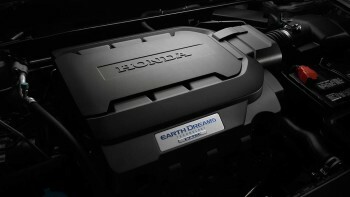 2.4L Inline Four-Cylinder Engine: One of the 2017 Honda Accord’s central strengths is its willingness to offer top of the line power as standard, so every model from the entry-level LX to the EX-L receives a 2.4L engine capable of up to 185 hp and 181 lb-ft of torque. 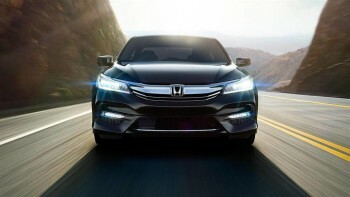 Sport Models: Honda developed the Accord Sport and Sport Special Edition models to provide their customers with enhanced performance in a mid-level trim. A less-restrictive dual exhaust is used to boost your output to 189 hp and 182 lb-ft of torque. 3.5L V6: Look beneath the hood of either an EX-L V6 or Touring and you’ll find a state-of-the-art six-cylinder powerhouse. It uses multi-point fuel injection to put up to 278 hp and 252 lb-ft of torque at your command. No matter your choice of engine, you’ll be able to rely on one of the cutting-edge transmissions listed below to return strong efficiency ratings and smooth performance. CVT: LX, Sport, Sport Special Edition, EX, and EX-L trim levels are also available with a CVT, which eliminates fixed gears to combine the efficiency of manual with the effortlessness of automatic. You’ll make up to 27 mpg in the city and 36 mpg on the highway* with LX, EX, and EX-L models, or 26 mpg city and 34 mpg highway* with Sport models; the latter can even add paddle shifters to provide direct control over your power ratio. The 2017 Honda Accord powertrains and mpg ratings are just part of why it stands out as a cut above other sedans. To find out more, or even arrange a test drive near Goshen and Monroe, don’t hesitate to contact Middletown Honda today.